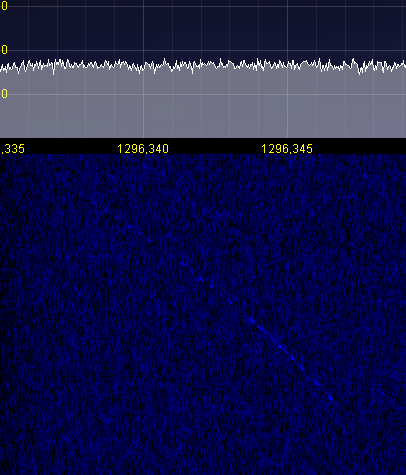 ISS bounce V: The QSO! After a lot of tests and improvements have been done in tracking the doppler shifted signals, Jan, PA3FXB any I had another try around 1296.300 MHz this morning. Both of us performed compensation of the own doppler component as well in receiving as in transmitting. We agreed in using the EME QSO protocol and periods of 30 seconds. Jan appeared within my filter bandwidth as soon as the ISS became visible to both of us. His signal strength was peaking up to nearly 20 dB above noise and was easy to copy. The tracked frequency seemed to be stable until the ISS culminated. Then the variation of the doppler shift became so rapid that the compensation mechanism was not fast enough anymore. But that happened to the very last part of our QSO while we were transmitting our final 73s. So I can state that the best signal quality can be expected during the ascending and the descending parts of the pass. Many thanks to Jan for his cooperation and his patience in numerous tests before. This success is dedicated to our fathers, who suffer from the same disease! If you are interested in a try, do not hesitate to contact Jan or me. You can find us in the HB9Q 1296 MHz EME logger or in the ON4KST microwave chat, when QRV. This entry was posted in ISS, ISS Bounce and tagged 1296 MHz, 23 cm, CW, dish, DJ5AR, Doppler, EME, International Space Station, ISS bounce, PA3FXB on 2013-05-23 by admin. Today Jan, PA3FXB and I used ISS passes to improve doppler compensation. The first pass of three was disappointing because no reflections could be detected. In the second one I found Jan shortly after his window opened. But it sounded more like a strange kind of music than CW, Jan stated after listening to the audio file, I recorded of his signal. The reason were too long steps in timing for the frequency correction. I reduced it for the last try from 100 ms to 10 ms. After some recalibration of frequency and rotor control I started the system again when the ISS rose. I could hear Jan without any manual corrections immediately after he started transmissions. The frequency tracking worked quite smoothly and reading his CW was possible without any problems. The audio file contains Jan´s signal in three periods. 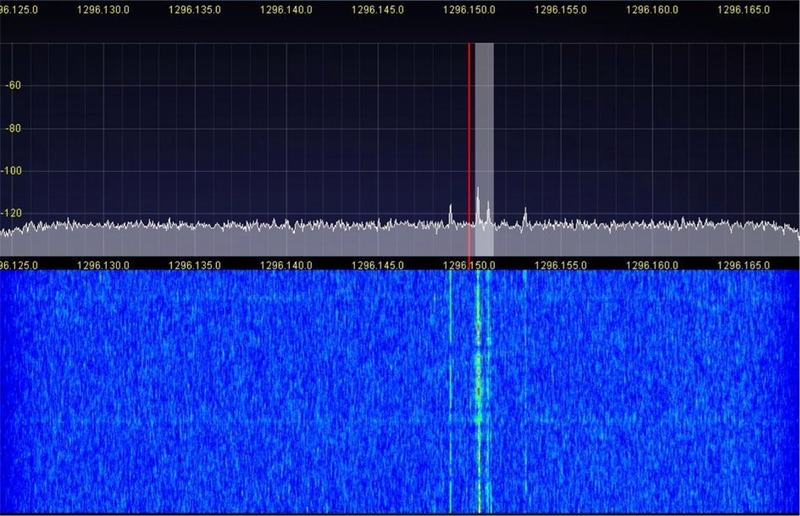 From 0:00 to 1:00 the signal raises while being on the upper flat part of the doppler curve shown above. During the second period from 1:00 to 2:00 the signal passes the steep part and even an adjustment every 10 ms leads to a kind of jumping signal. 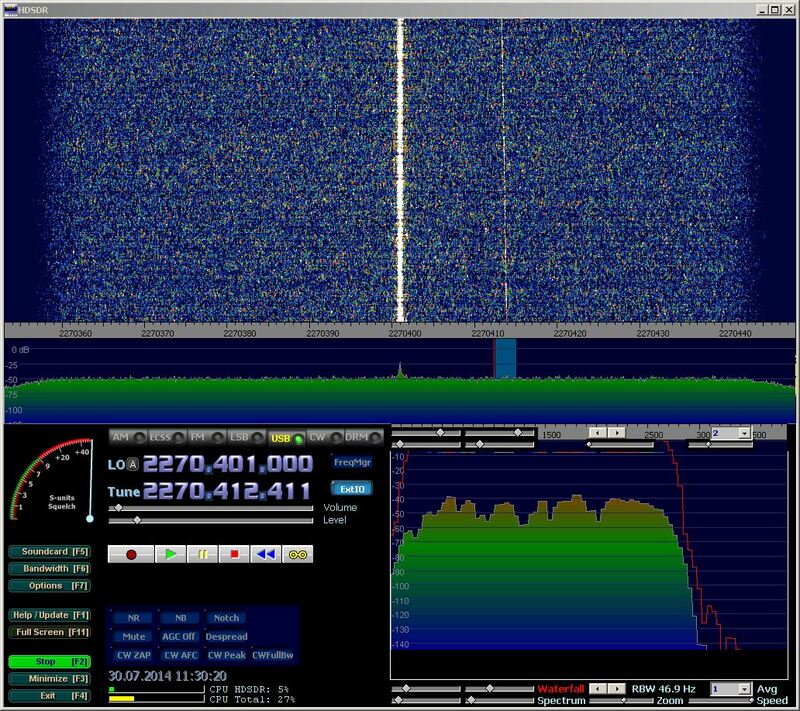 When receiving the third period, the signal was quite stable again and faded out, while the ISS moved to the eastern horizon. Doppler compensation on my TX part did not work. It seems that the SDR does not accept CAT commands for frequency change while transmitting. So we will work on another strategy, where TX frequencies remain fixed and both stations will do full doppler compensation only while receiving. This entry was posted in ISS, ISS Bounce and tagged 1296 MHz, 23 cm, AirScout, CW, DJ5AR, Doppler, International Space Station, ISS bounce, PA3FXB on 2013-05-10 by admin. Another test tonight with the experience of the one two days ago, was more efficient in finding the reflections. The ISS passed south of our QTHs. So I could track the whole pass from rise to set. Jan´s signal could be detected most of the time during his window. The picture shows his signal shortly after the rise of the ISS. Caused by the doppler effect it moves from right to left. The shift in this detail varied between 47 kHz and 38 kHz, while PA3FXB was transmitting on 1296.300 MHz in CW. By a length of about 25 seconds there was a variation of 400 to 500 Hz per second. Jan was transmitting his callsign “PA3FXB” followed by “T”s. The variation of the pitch in the first audio file is caused by manually tracking the signal. The second audio file gives an impression of the speed of the doppler variation. An effective compensation of the doppler effect seems to be most important. There have been earlier attempts to realize QSOs by reflections on the ISS. SM2CEW reports about nearly completing QSOs on 144 MHz with SM7WSJ in 2007 and he tried also with SV3AAF (more). DF2ZC claims the first ever QSO via ISS scatter on 2 m with DH7FB on December 9, 2007. They completed three more QSOs in 2008. It seems that these were the only four QSOs via ISS bounce since then. VA7MM reports about tests on ISS bounce with VE7BBG on 23 cm in 2004. 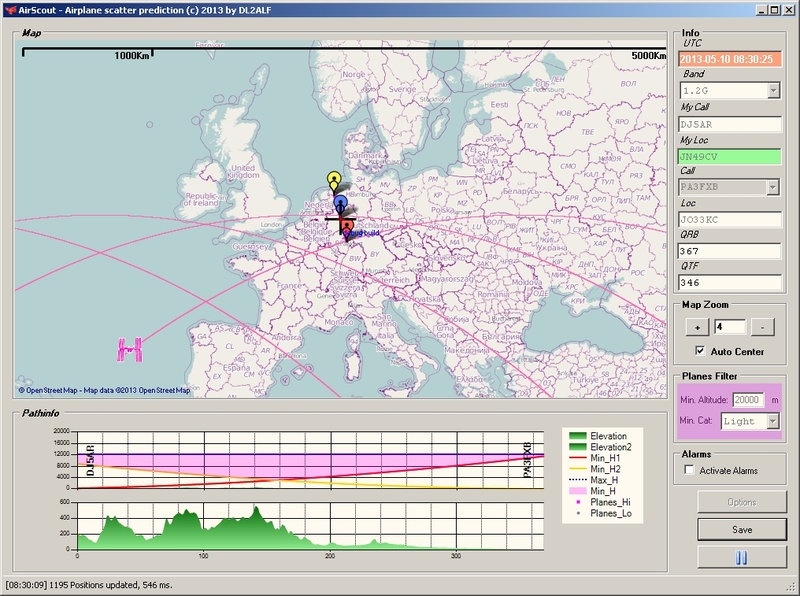 PE1ITR tried with DK3WN in 2007. This entry was posted in ISS, ISS Bounce and tagged 1296 MHz, 23 cm, CW, DJ5AR, Doppler, International Space Station, ISS bounce, PA3FXB on 2013-04-08 by admin. 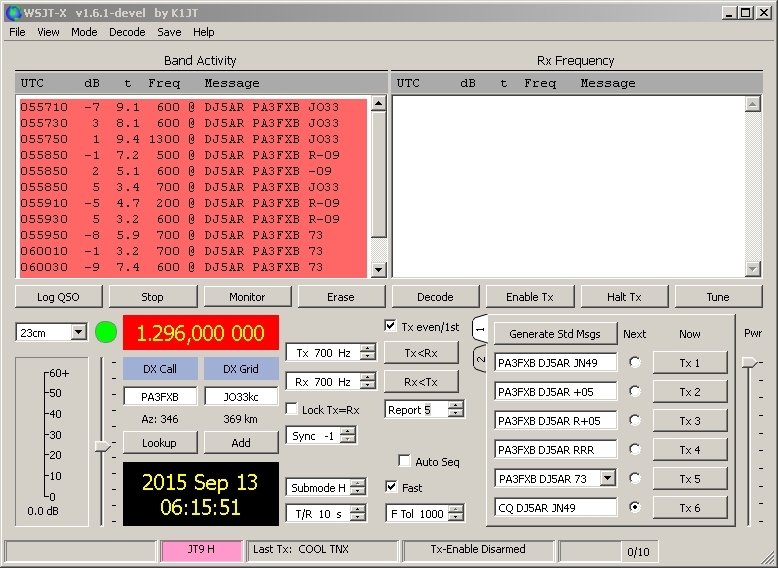 Tonight Jan, PA3FXB and I tried, what we were discussing about for quite a while. There was a prediction of an ISS pass shortly after local midnight and both of us had no other appointments. So we agreed that Jan should make a transmission on 1296.300 MHz as soon the ISS became visible to him and tracking it as long as possible. 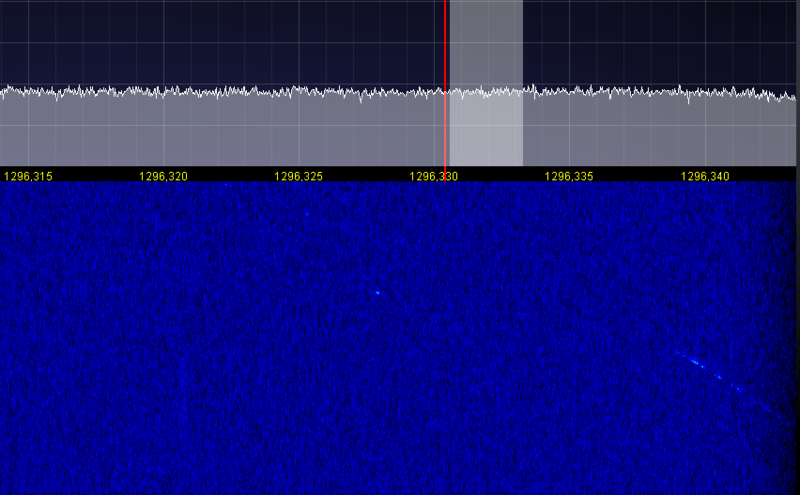 My part was to monitor the pass of the International Space Station on my SDR. We used 3 m dishes on both ends and Jan had approximately 375 W in CW. Here is the result. Jan appeared with a relatively strong signal (on the very right), faded out and came back with weaker signal strength. I interpret it, that the first appearance was backscatter and the second was forward scatter, what has to be discussed. Doppler was extremely strong and more than 40 kHZ at the beginning. This entry was posted in ISS, ISS Bounce and tagged 1296 MHz, 23 cm, CW, dish, DJ5AR, Doppler, International Space Station, ISS bounce, PA3FXB on 2013-04-07 by admin.